Are you looking for bathroom remodeling contractors? 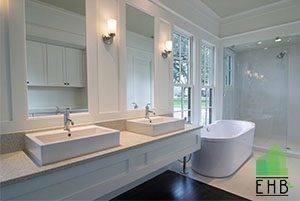 Bathroom remodeling is a major house improvement project. This investment not only enhances the look and enjoyment of the space but also improves the value of the home. Choosing the right bathroom remodeling contractor is the key to completing this project successfully. You can count on ECO Home Builders for your bathroom remodeling project. Whether you are looking to replace a shower, a tub, faucet, vanity, or completely remodel your bathroom, ECO Home Builders has the expertise and experience to make your project a reality. Our bathroom renovation specialists are skilled in all forms of bathroom renovations, from a simple shower work to a granite slab installations and custom tile replacements. Over the years, we have helped numerous homeowners remodel their bathrooms perfectly to match the modern styles and trends, including granite, tile, slab, natural stone and other surface design materials and concepts. We are fully licensed and insured. If you are looking to remodeling a bathroom in Florida and its surrounding areas, give EHB a call. We have all what it takes to meet your bathroom renovation needs. Whether your bathroom tiles are broken or damaged, or you simply want to replace them for a change. Whether you want new shower installed, or a vanity replaced, whatever your vision, EHB will help you achieve it. No job is too big or too small for us; we are capable of improving the looks and functionality of your bathroom professionally. 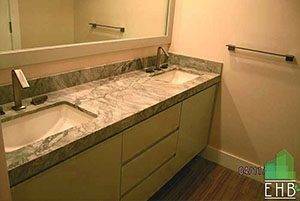 We are the experts in bathroom remodeling projects. Our renovation work will not only upgrade the look of your bathroom but will also increase your house’s value in the market. Whether you have a leaky shower in need of a replacement, or you want to replace the showerhead or install a glass shower door for a modern new look, our bathroom remodeling experts can do it all for a professional, clean, and polished look. 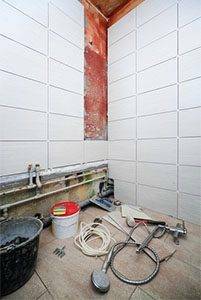 We at ECO General Contractors can help you improve the look of your bathroom by replacing old broken tiles with new elegant ones. 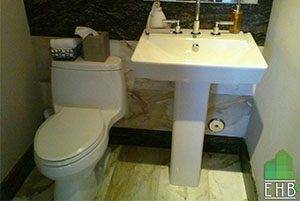 We have years of professional experience with bathroom renovations and repairs. You can expect nothing but the best from us because that’s what we deliver. Small details and improvements make all the difference when you are refreshing the look of your bathroom. Whether you like a contemporary bathroom design with a classic, clean look, or a luxurious bathroom with top of the line finishes, changing the fixtures will complement your style. EHB can change all types of bathroom fixtures for you, small and big. Whether you want to enjoy the luxurious experience of a Jacuzzi, or simply want to increase the value of your home, installing a Jacuzzi will do the trick. Our renovation experts have years of experience in renovating bathrooms to install hot tubs and Jacuzzis. You can expect a clean, quick, and top-quality professional work from us. Whether you want to upgrade your bathtub to a modern walk-in tub, Jacuzzi tub, or simply want to convert it to a shower instead, contact EHB. We can help you with your bathtub replacement needs. Are you ready for your bathroom remodeling? Request a free quote today! For more details call us today at 954-665-0852 or visit our click HERE and fill out a quick Form! Bathroom Remodeling Contractors	Overall rating:	5	out of 5 based on 8	reviews.